Mining Town is a village West of Floating Islands that spawns high-tiered military chests similar to that of Septus. There are many pitfalls that can mean certain death if you are not good at parkour. Watch your step here! Falling through holes in bridges or walkways can get you stuck, and the only way up is parkour. Weak Grapples for the most part are ineffective. Zombie Pigmen sometimes spawn by the mythic chest in the town, they can easily ambush a player who drops down without checking. You can get buttons from the chests inside the caverns, which can be used at nearby locations such as Fort Kharj or Death Mansion to resupply on potions. 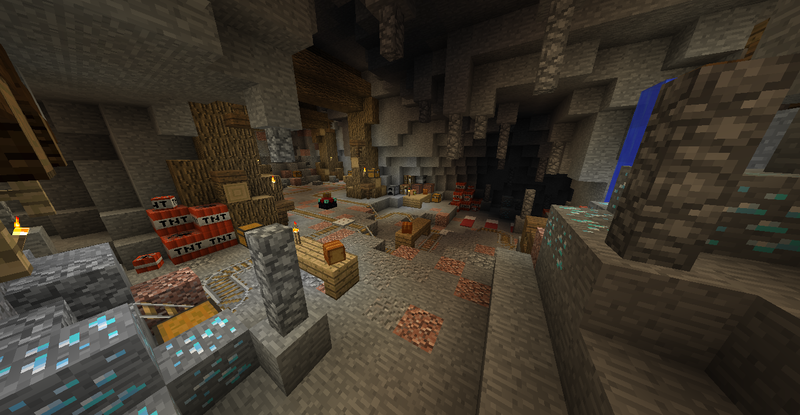 The crafting table is just North of the town, in the cliff mineshaft along with the 2 mil_epic chests. Luring the zombies into the lava is a good strategy to avoid having to deal with large hordes directly on the bridges. The only real risk in this town are the pitfalls and zombies, for they can push you to your death. However, you do not need any parkour to avoid these pitfalls. This is a very good source for high-tiered equipment. The cons are that this place has no food and no healing supplies. All three of these sources are located quite far, so be sure to stock up on all 3 before traveling here. There is a cavern which has been added on April 22nd, which can be accessed by doing parkour on the eastern side of the lava river, under the broken bridge. The chests are fairly high tier and it contains a water source along with a crafting table. To get back out you have to go back the way you went down through. Some of the lava jumps can be fatal but most can be recovered from. This location replaces Hell on Earth after the August 15, 2015 update. 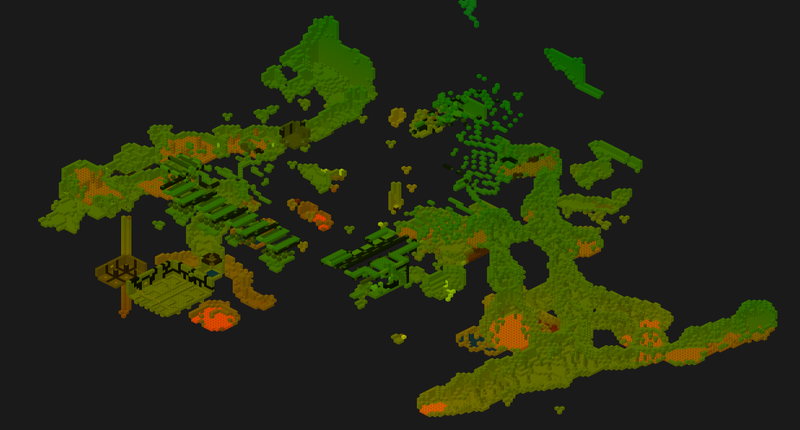 Hell on Earth was the second dungeon in MineZ history to be completely deleted from the map, with the first being Test of Virtues. There was an unknown scrapped dungeon under the town, which appeared to feature a maze, puzzles and a wave room. It is unknown what its purpose was. The overseer is certainly getting antsy. Ain't seen him this wound up since that job down in Lorfaul. Something ain't right here in this town, and I'm not excited about the next few weeks. The amount of diamonds in that cave is a sign. We shouldn't be anywhere close to here, especially after that lava leaking everywhere. This is Therum's domain, and she don't like outsiders. If we get this last vein of diamond from beyond that crevice, we get to go home. Lordram called for volunteers. Hopefully I can get out before Therum even knows I've been disturbing her. We've been blasting for weeks, but this rock is harder than we initially expected. Our explosives are having a hard time piercing the cave walls. I'm starting to get a bit suspicious of this "motherlode". The plan must have been miscalculated, but it's not my job to deal with lost profit. I've never seen so much diamond before in all my days. Even with this smaller vein my men and I could live comfortably the rest of our lives. No one would be able to touch us if we ran off with these... but there's more, just beyond a small rocky crevice. More blasting supplies are needed. It was a mistake to come here. A third of my men, trapped behind that collapsed wall, First, we'd have sprung into a lava chamber, then the rock composition, and now this? My remaining men are gathering as I write to send a tribute to Therum. May gods have mercy on those poor miners. The digging site inside the caverns. Mining Town seen from the Undeground view.